Château Siran is situated in the village of Labarde in the southern part of the Margaux appellation. It has been under the same family ownership [Mailhe] since 1859. 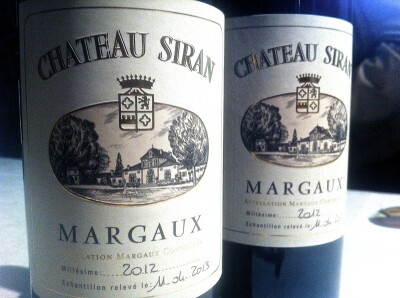 Generally good value Margaux, Siran can be a bit hard in the cooler vintages. 2012 is a particular success for the vintage. Vineyard/Soil: 25 hectares planted with 46% Merlot and 41% Cabernet Sauvignon and 11% Petit Verdot and 2% Cabernet Franc. Soils a mixture of pebbles and gravel. Hand picked into small crates. Fruit sorted at the winery. 2009 looks a safe bet here. Winemaking/Elevage: Temperature controlled fermentation and malolactic in barrel. Aged in 40-50% new oak, depending on the vintage. Consulting winemaker is Hubert de Boüard. 2009 Dense; quite saturated looking; pure, some mineral tones; menthol; palate feels pretty fat and deep; tannin too; maybe a little over-extracted in feel? Lots of fruit certainly and needs to settle. Good length but pretty tannic. 87-89?/100 [Earlier] Deep with good edge, vibrant; some floral elements; more violets; slightly lighter toned [coming after the Rauzan Segla in the en primeur tastings] – not super concentrated here; palate slightly spicy, pepper note with stalks; not that bad; fresh; quite high toned but will settle. 88+/100 [Second] Deep, dense; fresh nose, some violets but also bit of beetroot; lower octane here than the previous few; red fruits; very fresh palate; good perfume; more higher toned, Nicely done – quite attractive; extract and material. Tannins but they don’t dominate. Nice gentler more harmonious style. Very good. Knows it’s from Margaux. More settled than earlier sample 90+/100 Tasted 30th March and 1st April 2010.